Let us review gold futures trading as it stands regarding my ongoing trade from June 8, 2012. Over the weekend we saw the Greeks vote in the pro-bailout political party. What does this mean? Who knows, who cares. What did gold and other futures markets do as a result of the election, we will see promptly. Over the course of Sunday evening and early Monday morning, we saw gold futures drop a little bit over 20 points. However, the drop was temporary. Monday's close was very close to Friday's, and last trade was in the green by around 1 point. Let us look at a daily price chart for December gold futures. I am trading the December contract. If you are more interested in the August contract, which is currently the front month, then it should be almost identical except that it is trading about 4 points lower than the December. 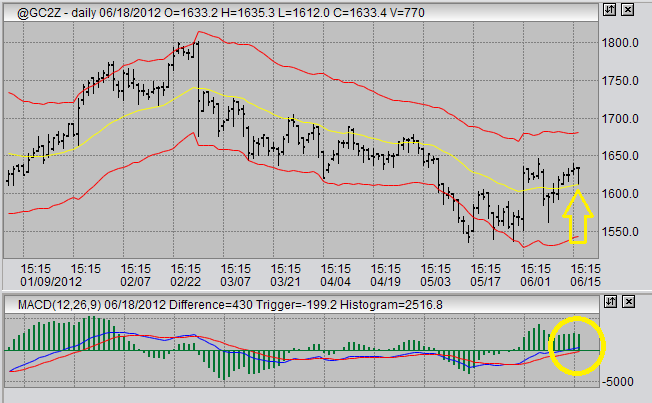 Observe that the drop in gold prices saw support at the moving average and promptly regained the lost ground. This occurred twice throughout the day. Once within an hour after Sunday evening market open, and again on Monday morning. What is this telling us? In my opinion, what we are observing is strength. People saw prices drop, and had enough confidence in the continued upward direction of gold to buy it up on weakness. Today's action makes four days in a row that price has closed above the moving average. In addition, the moving average has been slowly ticking up for about two weeks. In addition, if we look at the MACD on the gold futures trading chart, we can see that the MACD moving averages are crossing over the center line into positive territory. The fast line had already crossed over a few days ago, and the slow line should cross over tomorrow or Wednesday as long as nothing severe happens to the downside. This is indicative of continued steady momentum upwards. In the long run, we need to see more than just steady upward momentum. I would like to see occasional vigorous upward movements in order to keep the MACD bullish. I am currently holding a long position in gold that I picked up on June 8th at 1573 in the December contract. What we have observed today is telling me to hold, rather than take profits. Naturally, a stop loss order is being used to protect against loss. However, I am keeping the stop loss quite loose, as I do not want to be taken out prematurely on something similar to what happened today. My hopes for gold are that we see prices rally to the 1700 area and show some topping pattern on the 60 minute charts. I may use this as an opportunity to take profits, and then look for a re-entry along the moving average. Otherwise, I am generally planning to hold. Besides gold futures trading, I am still looking for a good long entry in to the sugar futures market. I am looking for both long and short trades in the USDX, but mostly short. I was looking for a long entry into AUD/USD futures, but I think I missed the ball there and I will now just wait and see where that market goes.